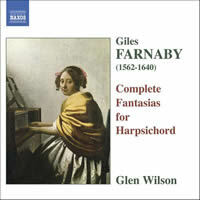 Giles FARNABY: Complete Fantasias for Harpsichord. Glen Wilson (hpsi). Naxos 8.570025 (http://www.naxos.com/). Distributed in the US by Naxos (http://www.naxos.com/). I can admire Wilson’s results without buying his thesis, that Farnaby (1562-1640) belongs with Byrd, Bull and Gibbons. In the Fantasias, he slices through the contrapuntal thickets before getting aloft in the free sections. Arrangements of vocal items offer a change in texture, the eight-part “Witness, ye heavens” scoring with its stately tread and cutting dissonances. The tuneful variation set “Loth to Depart” brings some much-needed charm — program, instrument and recording are on the stout side. 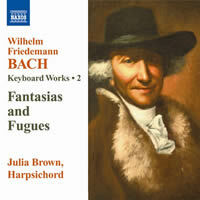 Wilhelm Friedemann BACH: Keyboard Works 2: Fantasias and Fugues. Julia Brown (hpsi). Naxos 8.570530 (http://www.naxos.com/). Distributed in the US by Naxos (http://www.naxos.com/). An acclaimed organist and out-of-fashion composer — on a smaller scale, W.F. Bach (1710-84) mirrored the fate of his father. He was also caught between eras. These aren’t his most personal efforts (likely the Polonaises would be) but they remain worth knowing, especially Eight Fugues. In major / minor pairs, each casts a sharp profile (Brown does No. 7 on her Richard Kingston harpsichord’s lute stop). By contrast, the Fantasias are sprawling, strenuous affairs with baffling mood changes. “The Balcarres Lute Book” (selections). 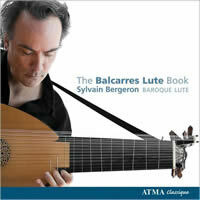 Sylvain Bergeron (13-course Baroque lute). Atma ACD2 2562 (http://www.atmaclassique.com/). Distributed in the US by Naxos (http://www.naxos.com/). This Scottish collection of 252 pieces dates from the early 1700s; Bergeron has pulled a tenth of it into six suites. No great discoveries emerge (dances betraying their violin origins, folk tunes, numbers from France and the London stage) but several stand out. “When she came in, she boobed” (bobbed?) unfolds very like “Greensleeves,” and Bergeron’s way with the Sarabands is reliably touching. “Adieu to the pleasures,” Ariel’s song in The Tempest, was prized for its sweet melancholy. 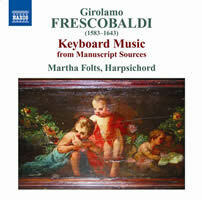 Girolamo FRESCOBALDI: Keyboard Music from Manuscript Sources. Martha Folts (hpsi). Naxos 8.570717 (http://www.naxos.com/). Distributed in the US by Naxos (http://www.naxos.com/). A superb instrument (the 1658 Jerome de Zentis restored by Keith Hill), vibrant sound and tasty mix of forms are somewhat undone in execution. Folts has good ideas but through a want of chops or imagination, the Toccatas, Correntes, Capriccios, etc. all proceed more similarly than they should. A few details are smudged, which I’d chalk up to the one-day taping. 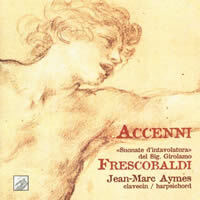 Accenni, Jean-Marc Aymes’ dashing, idiomatic 1998 disc of Frescobaldi manuscripts, is preferable and happily reissued. 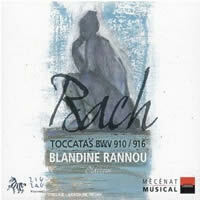 Johann Sebastian BACH: Toccatas, BWV 910-916 (1706-11). Blandine Rannou (hpsi). Zig-Zag Territoires ZZT050501 (http://www.outhere-music.com/en/labels/zig-zag-territoires). Distributed in the US by Allegro Music (http://www.allegro-music.com/). Her infrequent stabs at normality move me.